Urban Sketchers Midwest: March Scavenger Hunt--signs of spring! All the birds were at my urban feeder the other day--yes, even the red-winged blackbird, which always says spring to me! I've got another plan in mind to sketch for this hunt, perhaps later today while the snow's still on the ground...what says "spring" to you?? Getting the boat ready for the season? People shopping without coats? The zoo opening? The starlings are hogging our suet pole, intended for the woodpeckers that have depended on it for the whole winter. Starling's appearance; definitely a sign of spring here, too. 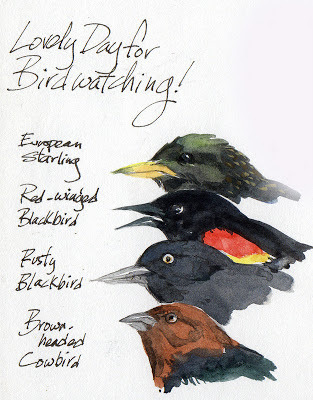 Another great bird guide painting! Beautiful birds Kate. I've got several feeders in our backyard and really enjoy watching the collection of birds that gathers each day. Thank you both! Yes, the starlings are definitely hogging the peanut butter feeders, Marcia! They're so funny to watch, we just keep filling them. I never knew I'd enjoy birdwatching so much, Dave! This is fun!